A balsamic nose of spices, eucalyptus, toasted bread, peat, dark chocolate and leather with hints of Chinese ink, black licorice and wet paint. The palate is much more expressive of the quality of the fruit than the nose and reveals fine-grained tannins, piercing acidity and pure flavors with some balsamic aromas making a comeback in the aftertaste. Biological: yes, No sulphites added. Unfiltered wine. Residue can occur. Sangiovese & Merlot with hints of vanilla, fresh and lively red fruit, chocolate, berries, game and slight smoky note. 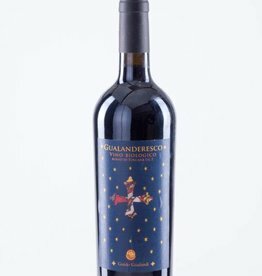 Guido Gualandi | Gualanderesco 2011 | Rosso di Toscana I.G.T.